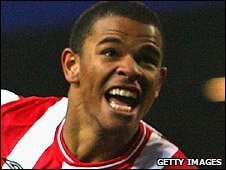 Fraizer Campbell scored twice and made Sunderland's other goal to ease his side past Blue Square Premier Barrow and into the FA Cup fourth round. Campbell's clever flick set up Steed Malbranque to fire the Black Cats ahead with a low shot into the corner. Sunderland's lead was doubled after the break when Campbell headed in Daryl Murphy's free-kick from the right. And on 58 minutes striker Campbell wrapped up the win when he nodded in Phil Bardsley's right-wing cross. Campbell's goals were his first for three months and were just what Sunderland needed as they initially struggled to put their non-league opponents away. Phil Bolland, Paul Bond and Marc Goodfellow all went close for the visitors before Malbranque's opener. And in freezing conditions Barrow refused to fold, keeping the score at 1-0 until seven minutes after the interval. But once Campbell had hit two goals in quick succession, the 8,000 away fans might have witnessed their tiring heroes suffer a thrashing. Darren Bent had a shot saved by keeper Tim Deasy, Malbranque fired just over and Campbell was inches away with a deflected shot. Deasy pulled off a magnificent point-blank save to deny Bent again and soon after tipped a drive against the bar. Campbell miscued another hat-trick chance when he headed high from close range and Sunderland substitute Ryan Noble dragged a shot across the face of goal. But Barrow - and their fans - can be proud of their efforts, while Sunderland will be delighted with Campbell's return to goal-scoring form. "I'm delighted for Fraizer because he's had to wait patiently and he's only a young player. The young players have done particularly well today. "The second goal was important because Barrow played their part - they were spirited and made it a proper cup tie. "I wasn't really anxious but it was a difficult day for everyone." "I'm definitely proud of them. I didn't think there was much in the game in the first half and the goal just after the break has killed us. "We had a couple of chances early on and you're hoping one gets deflected in because that would give the lads confidence. "In the first half we matched them well. I'm proud of the lads and I admit in the end Sunderland were the better team. "They dominated especially in the last 30 minutes but we did well." 90:00+3:08 The match has reached full-time. 90:00+2:28 David Healy is caught offside. Free kick taken by Tim Deasy. 90:00+1:59 Effort from inside the area by Ryan Noble misses to the right of the goal. 90:00+1:01 Corner taken by Mark Boyd, clearance by Jordan Henderson. 90:00+0:41 Corner taken by Mark Boyd, clearance by Paulo Da Silva. 90:00+0:24 Andy Bond delivers the ball, clearance by Paulo Da Silva. 89:19 Corner taken left-footed by David Healy. 89:05 David Healy takes a short corner. 88:42 Shot by Steed Malbranque. Robin Hulbert gets a block in. 87:59 Ryan Noble takes a shot from 18 yards. Comfortable save by Tim Deasy. 86:03 Inswinging corner taken by Andy Bond, Close range headed effort by Robin Hulbert clears the crossbar. 85:16 Gareth Jelleyman fouled by Lorik Cana, the ref awards a free kick. Mark Boyd shoots direct from the free kick, save by Marton Fulop. 83:45 Substitution Marc Goodfellow goes off and Mark Boyd comes on. 83:31 Fraizer Campbell has a headed effort from close range and clears the crossbar. 81:22 Marton Fulop restarts play with the free kick. 81:22 Substitution Michael Liddle replaces George McCartney. 81:22 Carlos Logan gives away a free kick for an unfair challenge on Jordan Henderson. 75:56 Simon Spender takes the free kick. 75:56 Substitution Daryl Murphy goes off and David Healy comes on. 75:56 Simon Spender fouled by Daryl Murphy, the ref awards a free kick. 75:31 A cross is delivered by Jordan Henderson. 73:20 Shot from inside the six-yard box by Ryan Noble goes wide right of the target. 72:39 Phillip Bardsley gives away a free kick for an unfair challenge on Andy Bond. Simon Spender takes the free kick. 71:28 Substitution Ryan Noble replaces Darren Bent. 71:28 Substitution Gavin Rothery replaces Gregg Blundell. 71:28 Shot from just outside the area by David Meyler misses to the right of the target. 71:13 Daryl Murphy takes a short corner. 70:48 Darren Bent takes a shot from 6 yards. Save made by Tim Deasy. 70:08 Gregg Blundell is ruled offside. Free kick taken by Marton Fulop. 69:53 Booking The referee shows Fraizer Campbell a yellow card for unsporting behaviour. 69:18 Booking The referee shows Tim Deasy a yellow card. 68:19 Foul by Jason Walker on Phillip Bardsley, free kick awarded. Free kick taken by Phillip Bardsley. 67:15 Robin Hulbert fouled by David Meyler, the ref awards a free kick. Robin Hulbert takes the direct free kick. 66:57 Darren Bent takes a shot. Tim Deasy makes a comfortable save. 66:28 The official flags Jason Walker offside. Indirect free kick taken by Paulo Da Silva. 65:51 Effort from the edge of the box by Jordan Henderson goes wide of the left-hand post. 65:09 Corner from the right by-line taken by Andy Bond, clearance by David Meyler. 62:45 Fraizer Campbell takes the chance to get an effort at goal. Tim Deasy makes a save. 60:40 Free kick awarded for an unfair challenge on Daryl Murphy by Simon Spender. Direct free kick taken by George McCartney. 59:46 Shot from just outside the area by Steed Malbranque goes over the bar. 59:26 Short corner taken by Daryl Murphy. 58:42 Shot by Darren Bent. Save by Tim Deasy. 57:48 The assist for the goal came from Phillip Bardsley. 57:48 GOAL - Fraizer Campbell:Sunderland 3 - 0 Barrow Fraizer Campbell scores a headed goal from deep inside the penalty box. Sunderland 3-0 Barrow. 57:14 Phillip Bardsley sends in a cross, Phil Bolland manages to make a clearance. 55:58 The assistant referee signals for offside against Darren Bent. Tim Deasy takes the free kick. 55:02 Substitution Carlos Logan comes on in place of Paul Rutherford. 53:01 Unfair challenge on Phil Bolland by Daryl Murphy results in a free kick. Tim Deasy takes the free kick. 51:30 Daryl Murphy provided the assist for the goal. 51:30 GOAL - Fraizer Campbell:Sunderland 2 - 0 Barrow Fraizer Campbell grabs a headed goal from close range. Sunderland 2-0 Barrow. 49:21 Inswinging corner taken right-footed by Jordan Henderson, Headed effort from inside the area by Fraizer Campbell misses to the right of the goal. 48:19 Jason Walker has an effort at goal from outside the area missing to the wide right of the goal. 46:34 George McCartney sends in a cross, Phil Bolland manages to make a clearance. 45:00+1:10 Fraizer Campbell produces a right-footed shot from just outside the box that goes wide right of the target. 44:42 The match has reached half-time. 44:19 Free kick awarded for a foul by Steed Malbranque on Gareth Jelleyman. Gareth Jelleyman takes the direct free kick. 44:01 Steed Malbranque produces a drilled right-footed shot from 18 yards. Save by Tim Deasy. 42:54 Inswinging corner taken by Jordan Henderson from the left by-line played to the near post, clearance by Simon Spender. 42:33 Shot by Jordan Henderson. Save made by Tim Deasy. 41:19 Shot comes in from Andy Bond from the free kick, David Meyler gets a block in. 41:19 Booking George McCartney is shown a yellow card. 40:50 Marc Goodfellow fouled by George McCartney, the ref awards a free kick. 40:13 The free kick is delivered left-footed by Gareth Jelleyman from left channel. 40:13 Booking Lorik Cana is shown a yellow card for dissent. 39:47 Lorik Cana concedes a free kick for a foul on Marc Goodfellow. 36:52 Robin Hulbert fouled by Phillip Bardsley, the ref awards a free kick. Tim Deasy takes the direct free kick. 36:09 David Meyler takes a shot from just inside the penalty box which clears the bar. 35:40 Corner taken by Daryl Murphy from the right by-line to the near post, save by Tim Deasy. 35:32 A cross is delivered by Daryl Murphy, Mike Pearson manages to make a clearance. 33:57 Shot by Darren Bent. Save made by Tim Deasy. 32:14 Free kick awarded for a foul by David Meyler on Jason Walker. Simon Spender takes the direct free kick. 29:20 Andy Bond has a drilled shot. Marton Fulop makes a comfortable save. 28:21 David Meyler crosses the ball, Tim Deasy makes a comfortable save. 26:25 Corner taken by Andy Bond. 26:11 The ball is sent over by Simon Spender, Lorik Cana manages to make a clearance. 25:26 Marc Goodfellow takes a shot. Save made by Marton Fulop. 23:33 Inswinging corner taken right-footed by Jordan Henderson from the left by-line to the near post, Daryl Murphy has a headed effort at goal from close in which goes wide left of the goal. 23:17 The ball is crossed by Daryl Murphy, clearance made by Gareth Jelleyman. 22:00 Booking Robin Hulbert receives a caution for dissent. 19:05 Daryl Murphy produces a cross. 16:30 Assist by Fraizer Campbell. 16:30 GOAL - Steed Malbranque:Sunderland 1 - 0 Barrow A goal is scored by Steed Malbranque from inside the box to the bottom right corner of the goal. Sunderland 1-0 Barrow. 15:23 Free kick awarded for an unfair challenge on Jordan Henderson by Jason Walker. Lorik Cana takes the free kick. 14:38 The offside flag is raised against Darren Bent. Tim Deasy takes the free kick. 13:49 Free kick awarded for a foul by Phillip Bardsley on Jason Walker. Free kick taken by Jason Walker. 12:09 The ball is sent over by Marc Goodfellow. 10:03 Foul by Jason Walker on Steed Malbranque, free kick awarded. Direct free kick taken by Lorik Cana. 9:43 Free kick awarded for an unfair challenge on Darren Bent by Robin Hulbert. Direct free kick taken by George McCartney. Correction - 9:14 Short corner taken by Paul Rutherford. 8:20 Free kick awarded for a foul by Fraizer Campbell on Robin Hulbert. Shot on goal comes in from Phil Bolland from the free kick, save by Marton Fulop. 7:18 Effort from inside the area by Phillip Bardsley misses to the right of the target. 6:33 David Meyler fouled by Andy Bond, the ref awards a free kick. Direct free kick taken by George McCartney. 5:49 Jason Walker challenges Daryl Murphy unfairly and gives away a free kick. George McCartney restarts play with the free kick. 5:15 Effort from 25 yards by Marc Goodfellow. Save made by Marton Fulop. 4:40 Steed Malbranque produces a right-footed shot from just outside the box that misses to the right of the goal. 4:13 Corner taken by Daryl Murphy from the right by-line played to the near post, Tim Deasy makes a save. 3:47 Free kick awarded for a foul by Marc Goodfellow on Phillip Bardsley. Phillip Bardsley takes the free kick. 3:23 Marc Goodfellow produces a drilled right-footed shot from 25 yards. Blocked by George McCartney. 2:18 Daryl Murphy takes the outswinging corner, clearance made by Phil Bolland. 1:55 Inswinging corner taken by Jordan Henderson, clearance by Mike Pearson.